My daughter is lego obsessed. And I couldn’t be happier. What a wonderful creative outlet for kids. With all her Christmas checks, she ordered the Harry Potter Diagon Alley set. She anxiously awaited the package, tracking it online every day and has been working on it diligently since the minute it was delivered. I have always loved legos as well. 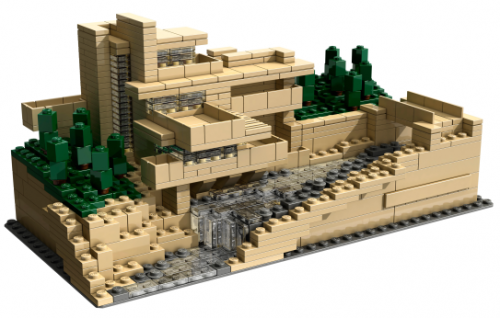 How can you not love a company that inspires kids and adults alike with the opportunity to build structures like Frank Lloyd Wright’s Falling Water with its products. 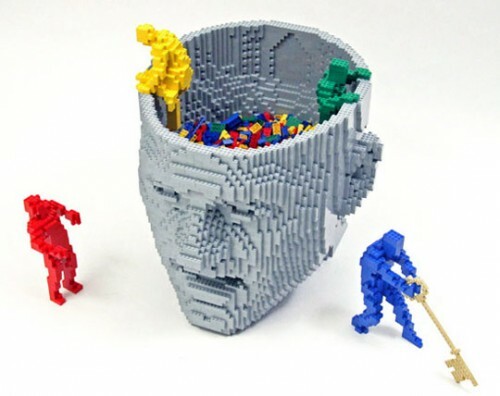 Legos are such a great creative tool that requires visual and mental acuity as well as a certain dexterity. 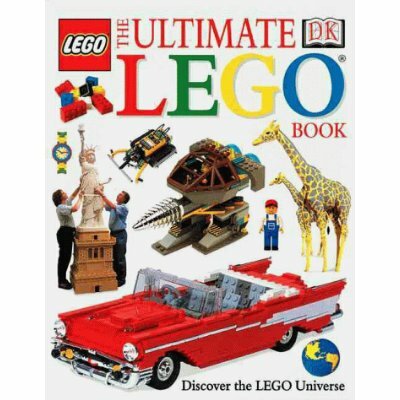 Although you can buy sets, you can also build from scratch from your imagination or with a little inspiration like this fabulous DK book we own. And Lego has really started marketing their wares in the last few years. 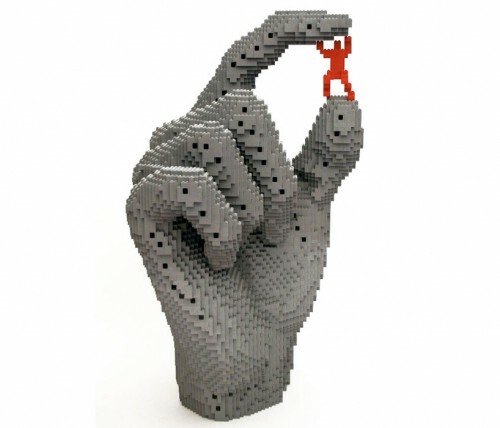 Have you seen the amazing lego statues at the store on Michigan Ave. in Chicago? There are of course the Legoland locations in California and Florida as well as Europe. 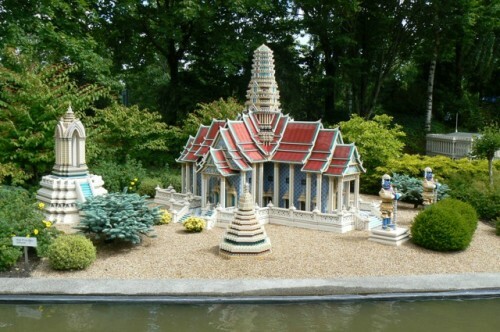 The original Legoland is in Billund, Denmark where incredible examples of lego structures like this one of Wat Phra Kaew, the most important temple in Thailand, housing the Emerald Buddha, reside. Or this reconstruction of Bergen, Norway. Yes, that is all legos! But legos aren’t just for kids. 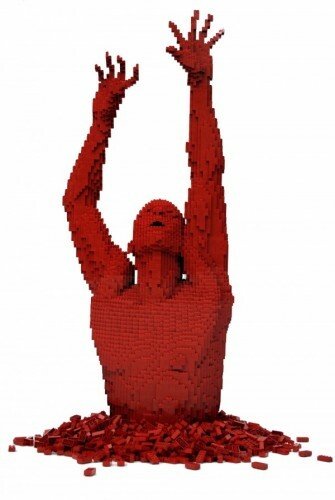 Nathan Sawaya is an artist who makes thought provoking sculptures from legos. Originally a corporate lawyer, Sawaya won a Lego contest and then started receiving commissions. His pieces can take up to three weeks to build from the more than 1.5 million lego bricks he keeps in his studio. 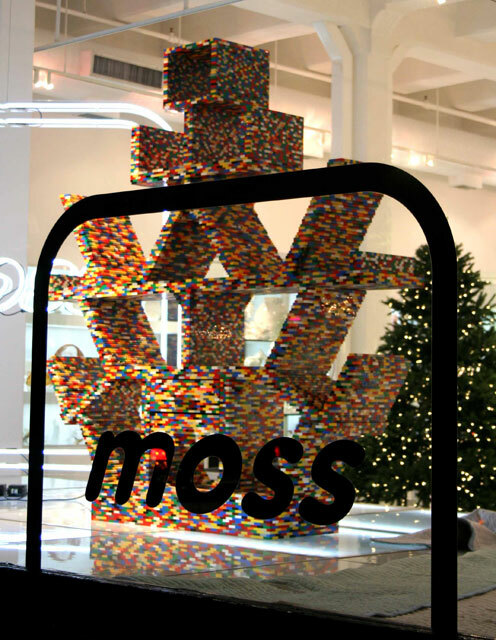 During the holidays we was commissioned to build a lego replica of Ettore Sottsass’ famous Memphis work, the Carlton cabinet, for the Moss Gallery’s windows. And also around the holidays, he had an exhibit, Red, at the Agora Gallery in NYC where he explored themes of identity. Lego even produces art films – there are two so far – both incredibly fun, creative and thought provoking. I’ve attached them for you to see. I think the Brick Thief’s playful take on alternate universes is rather like Inception lite – and rather brilliant. And this is the best part about legos – it’s a product that can be enjoyed on so many different levels from the young to the young at heart. This entry posted in art, books, children, design, entertainment, games, learning, sculpture. Entry Tags: Harry Potter Diagon Alley Lego Set, Lego, Lego Architectural Series, Lego films, Legoland, Moss Gallery, Nathan Sawaya, The Ultimate Lego Book Bookmark the permalink. I love the whole concept of Legos. They are creative, fun and they also build collaboration when kids are working together. They’re just great! Hi Kathleen – Totally agree – so many great qualities. Christina – It’s seems to be becoming an art form in and of itself – clearly your father was the creative sort. Legos are so muc fun and they help to make kids more creative in their thinking simply by building. AO – Fun,creative and clearly Lego is realizing that their appeal goes beyond just kids. Great post…I loved the short films. What a smart company…we need more like them. Jane – aren’t the films great! Totally agree – wouldn’t it be great if more companies thought this way. All three of my sons were huge legomaniacs….took them to Lego land in Ca. and they had the best time (I was pretty impressed too) One of the very best things is that its old fashioned fun, requiring them to use their head, their hands and creativity- no techonology involved….allelujah! TEH – I love any sort of creative play – and agree – love that it doesn’t involve technology, although lego has some pretty cool online games. I also find lego so cool and great for kids. It truly helps them with their creativity. My brother lives in England and they have a huge Legoland place near them…Its s much fun to go there!!! Diana – Yes, the Legoland in England is supposed to be fabulous. Clearly adults are discovering the possibilities of legos as well. Oh I was utterly hopeless at Lego as a child; and jigsaws, board games, puzzles of any kind – I think my parents secretly hoped I’d been mixed up and their real child was being brought up elsewhere. Tabitha -Too funny – I’m sure your parents appreciated your many other talents as well! I wish I had a dollar for every Lego that I have picked up during my children’s childhood. There is not a better product on the market. I love the little village kits. We have avery large Lego store north of here. Thank you for sharing. Brings back great memories. HI Teresa – I know me too – tons and tons of legos. But clearly they’re not just for kids any more! Maureen – Great system. I love the direction the company is going with these incredibly creative films and that clearly adults are getting into the fun! My 6 year old is just discovering Legos. With two boys, I am sure we have many brciks in our future! We’ll have to check out his youtube channel for sure. And wasn’t the “flux capacitor” the part Michael J Fox needed to fix his time machine in Back to the Future? Love legos! 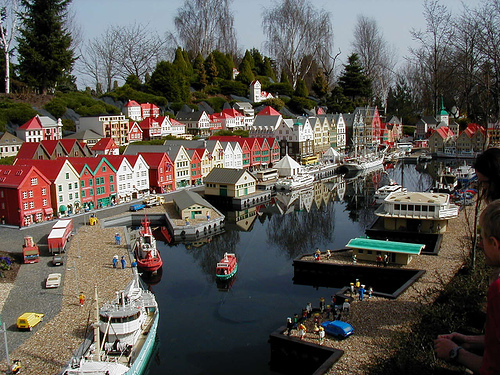 When we lived in Norway we visited Legoland in Denmark and marveled at everything that could be done with a lego. My kids loved them and played with them constantly. I’ve always told them when I get old, just push my wheelchair up to a table filled with legos and I’ll be happy. 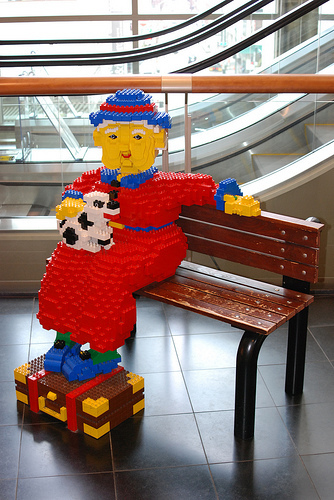 Carla – Legoland in Denmark looks amazing. And that’s of course one of the great things about legos – something that both parents and kids can do together! SA – So glad you enjoyed – I just love what they’re doing!! Such fun! That little town is simply incredible. And isn’t it wonderful that your daughter is building and creating her own wonders. SM – Isn’t it incredible?! I love that she is involved with such creative play. And re: comment – my pleasure of course! Both of my son’s are lego obsessed, but Carter is a real master. He will open his Diagon Alley set tomorrow morning on his actual birthday! We saw that amazing Lego exhibit in Greenwich last year….we just need to make it down to Legoland! PPT – Oh I’m sure he will LOVE the Diagon Alley set – Gringot’s is especially cool. Danielle – I can imagine. That DK book is FABULOUS!! Wait til you see the things they have made!! 84 queries in 0.539 seconds.